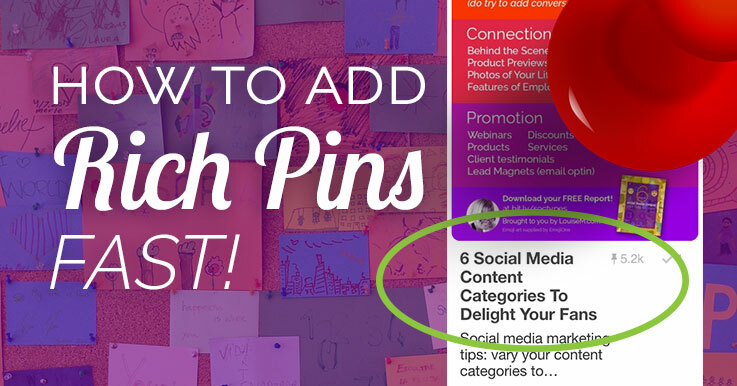 How to Add Rich Pins to Pop Your Pinterest Posts - Fast! You are here: Home / Pinterest Tips / Rich Pins Pop Your Pinterest Posts! Here’s How to Add ’em Fast. 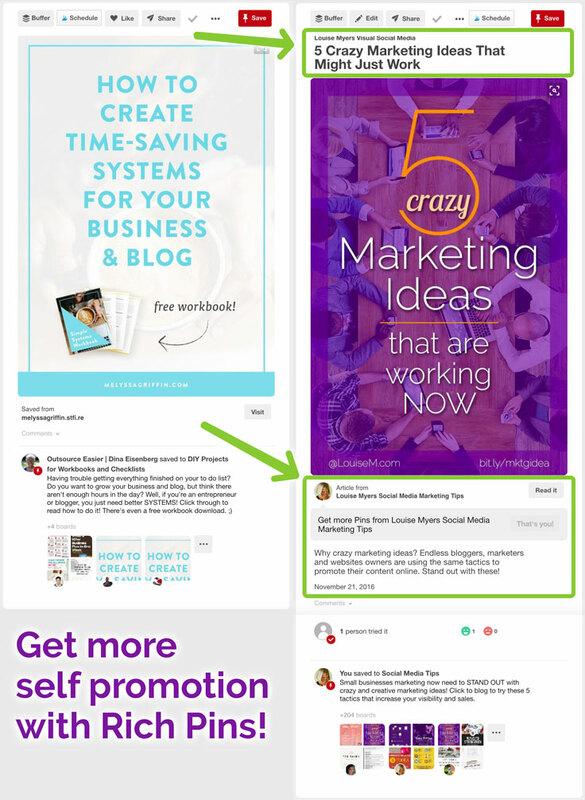 Rich Pins Pop Your Pinterest Posts! Here’s How to Add ’em Fast. Have you heard of Rich Pins? Pinterest Rich Pins have been available for some time – but are you using them? You should! They really pop your presence on Pinterest. Rich Pins are pins that include extra information right on the pin. Article Rich Pins include a bold headline, in addition to the story description, in the stream. And when someone clicks the Rich Pin – not just the bold headline, but a little push to follow the “Rich Pinner!” See the difference? Another really cool feature of Article Rich Pins is that when you update the meta data on your blog post – whether the post title or meta description – this will update across all previous Pins from that article. Isn’t that fantastic? Perhaps you haven’t added them because you didn’t realize how fast and easy it is – if you blog with WordPress. If you don’t, you might need some tech help to add the needed markup language to your site. But on WP, it’s done for you! There are now several types of rich pins. 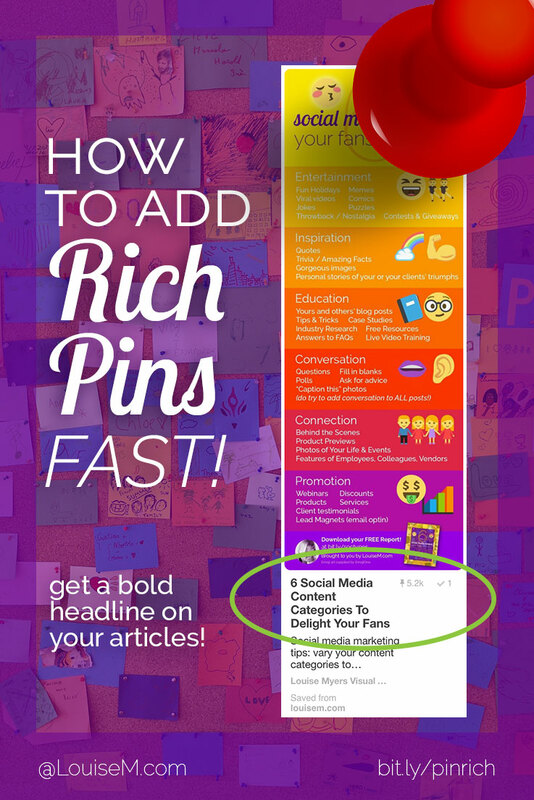 Article Rich Pins are perfect for bloggers. There are also product, recipe, movie, place, and app rich pins. This tutorial only works for article pins. You must be set up as a business account on Pinterest. It’s easy to switch, and you get free analytics! Set up or convert to a Pinterest business account here. Step 1: Add Yoast SEO Plugin. Activate it. Then go to the Social tab in its settings, then to the Facebook tab. Check Add Open Graph meta data at the top. NOTE: If you use Genesis themes, you already have Yoast, so skip this step! If you use a different SEO plugin, ask a techie for help. Just go to this link, enter a URL from your site, and check that the Rich Pin preview is what you expected. 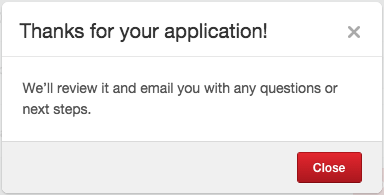 Click Apply Now, and wait to hear from Pinterest. This whole process takes less than 5 minutes! It may take a couple weeks to hear from Pinterest with your approval. You’ll be so glad you took a few minutes to set it up! 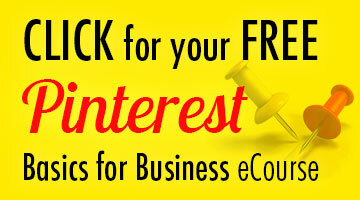 Share this post with others who could benefit from Pinterest Rich Pins. Thanks! Get ONE simple action step each day to optimize your Pinterest account. Join now! Yet another helpful post for me a small ministry owner! Thanks for offering simple explanations for people who know more about writing and their content than social media! I’m going to check this out. Thanks for your comment, Elizabeth! Happy you found this helpful. Quick update – got approved almost immediately but I have a question. What does this actually mean? Is it that each time I (or a website visitor) pins something from our website, the pin is a rich pin, from now on in? Or is it that all pins that have been pinned from our website now are in the rich pin format? All pins from your site going forward should be rich pins. I don’t believe it’s retroactive to previous pins. If you notice something different, let me know! Thank you Louise, that was rather easy!! I did 3 sites in less than 10 minutes. Now I will surprise my Mom by setting her up as well. Cheers! Fantastic! Glad to hear it worked so well. Fab share Louise, I had heard of rich pins and the new app pins which are only availalbe in the USA but had not added to my website. So I followed your easy instructions, I already use SEO by Yoast and my Facebook meta was already checked so all I had to do was apply to Pinterest. It now appeared almost instantly on the #30dailydoables board! Fantastic Emma! Happy to hear it worked so easily for you. Hi Louise, so is your article really only geared for those with a WordPress site? If so, would be great to learn how those without WordPress sites can do this also? If not on WordPress, you need to be somewhat techie, or have your techie take care of it for you. You need to know how to add meta tags. Awesome! Thanks for the tip, Angela. Louise, thank you for the simple information. I was looking to add Rich Pins for my client’s website. There are some plugins that add meta tag, but I was not aware that Yoast WordPress SEO already done the same thing. I have verified and applied but it was not showing “Author” info. Thank you for the simple and descriptive information. My pleasure, Zara, I’m glad it helped! Thanks for taking the time to comment. Thanks so much for sharing this easy to follow tutorial, every time I tried to do this by following the Pinterest tutorial I never got anywhere and my eyes glazed over – copied yours and had my rich pins operating in 5 minutes – just as you indicated. Great post, thank you. I know what you mean, Danielle, they made it too confusing for me 🙂 I’m glad this helped! Thank you for this great article. Just a question, though. Can you add hashtags in at some point in the process? When you pin, you can edit the description and add hashtags exactly the same way as “regular” (not rich) pins. Wow that was so easy & so helpful! I was reluctant to even touch Rich Pins (though I really wanted to have them!) coz the whole concept of complicated code freaked me out. But this was a breeze – thank you so much for this post, I’m waiting for Pinterest to let me know! Woot! I am interested in creating recipe pins. I have completed all of the steps (thanks for the amazing info!) and have been “approved”. Do my rich pins have to come from a web/blog post? Or can I create my pin, and upload it from my computer and have the rich pin qualities (i.e. the ingredients)? I’m pretty sure Rich Pins only work when they’re pulling the info from a linked URL. You might be able to upload the pin and then link it to the URL and have it still pull the info – I haven’t tested this. I have yoast seo working fine and followed your tips above and everything is showing up fine except it is not showing “Author” info. Thank you for the helpful article..
Reach out to Pinterest Help (https://help.pinterest.com/en) or your tech person. I followed above steps but still not getting validated. it keeps giving me this error. We were unable to retrieve any data from your URL. do you have any idea how i can fix this issue? Did you try using a different blog post URL? If that doesn’t work, contact Pinterest help. Do I need to add the ‘Rich Pin documentation’ into my blog posts? If so, do I use the ‘open graph’ method? I have WordPress so I don’t know how to edit the header of a specific blog post. Use the Yoast WordPress plugin as noted above. You don’t have to do anything in your blog posts, Yoast takes care of all that for you. Hi, Thanks for this amazing article. 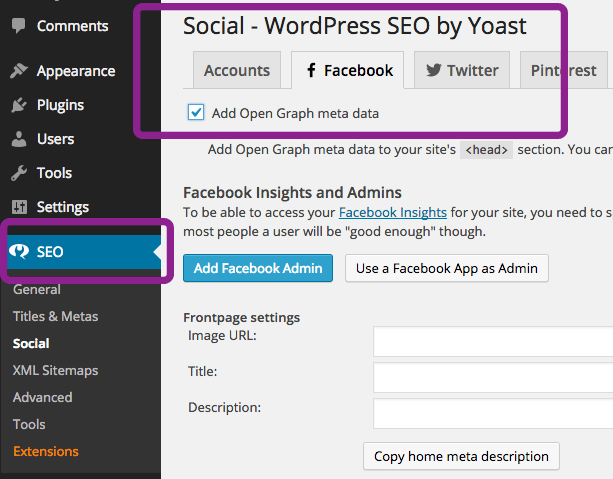 But yoast seo plugin do not have option for Pinterest specific description. 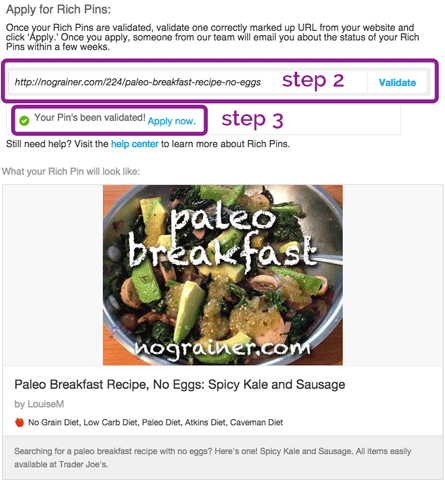 I was able to enable ARTICLE type rich pin but I want to enable recipes based rich pin where my pin can show ingredients and direction on the pin on pinterest. So do you have any latest tutorials on this? The only plugin I know of for a Pinterest description is Social Warfare. And I don’t know how to enable recipe rich pins. Great article! Thanks for making it so easy for us! My question: is it possible to do this with WordPress accounts that are not on a premium subscription? And is it possible to do the same thing but through Jetpack? If you’re not self-hosted, I don’t know if you can use Rich Pins. Except that Shopify and Etsy have their own process. We’ve already done the whole procedure described in the article, but only 21 out of 350 Woo products are visible as rich pins. We also use Yoast WooCommerce SEO plugin that is supposed to add additional functionality (like price, etc.) to Rich Pins. Is there any limitation to a # of rich pins disaplyed ? Thx. When you add rich pins to a website, all pins from the domain will be rich (tho there may be glitches at times). I don’t know anything specific to Woo tho. Self explanatory enough to grab. In my own opinion, Pinterest is a sort of a hit or a miss thing when it comes to Rich Pins. It is either it works for you (and by that I mean drive good traffic to your blog) or not. We recently disabled rich pins on our blog and the referral traffic shoot up, turned out that Pinterest is scrapping all our content and using it as the description. We tried to amend this glitch of course, but nothing works. I hope Pinterest will sort it out and make it more better. Rich Pins are supposed to scrape metadata, so this isn’t considered a problem or error. You can and should write a separate pin description though. The matadata were actually well configured and we have meta description provided with each post. We have structured data, twitter card and open graph enabled, and all looks well on facebook and twitter, except on pinterest. The problem (or glitch) as we found out is, pinterest ignored the meta description and instead go for the post body when scrapping metas on our site. Writing a separate pin description is a no no lol, that’s like me sacrificing my time for what could have been automatically done on their side. What is the essence of rich pins if I have to manually write the description. Pinterest pulls the metadata for me. They only pull the beginning of the post body when the metadata isn’t set up properly. BUT you’re sabotaging your possible success on Pinterest if you don’t write a specific Pinterest-friendly description for each different pin. You’ll have BOTH the meta description AND the one that’s optimized for Pinterest when you have article rich pins. PLUS the post title! Google users and Pinterest users are not the same. If you don’t want to optimize your Pin description, then don’t expect good results. Oh! seems like we didn’t quite understand each other. There is “nothing” wrong with our metadata, all other metas (title, featured image, date, author e.t.c) were pulled quite right, except the description. We have open graph enabled, and since pinterest supports open graph for pulling data, we didn’t setup separate meta tags for pinterest. Facebook pulled all the data (including the description) quite right on their end, and we expect Pinterest to do the same, its just that they don’t. If our metas worked perfectly on facebook, they supposed to work well on pinterest too since the same metadata were pulled. Writing a separate description on our rich pins wouldn’t have help in our case since the post content (THE FULL ARTICLE) were used as the description. What description else do we have to write when all the content were already laid bare for pinterest users to read without even clicking the link. Hope you understand. That’s super weird. I have NEVER seen Pinterest replace the actual pin description with ANY kind of metadata. I’m baffled as to why your rich pins work differently from everyone else’s I’ve seen. What country are you in? Also, have you tried using the rich pin debugger? I just tried to pin from your site and all that pulled into the description was the image name with hyphens. I realize you’ve turned off rich pins, but you do need to learn how to set a pin description. Thanks for checking out. We thought it weird too for the whole article to be used as the description. And yes, we are familiar with the meta description and the pin description. We are actually looking into the pin description thing. If a visitor tried to pin a post on our website via the pin it button the description is not added, BUT if the post url is FETCHED on pinterest (or manually fetched on pinterest via the add new pin option) the post description is automatically added into the description box. This may have something to do with the share button and we are currently looking into that. Gracias! What do we do when this doesn’t work? Hi I followed these steps and it says everything is approved but I do not see it showing up. My pins still look like regular pins and this has been a couple days now. Is it supposed to take a while to show up even after it immediately said approved? It can take a few days. Have you tried the debugger? Thank you Louise, worked well for me. I just started a new blog will need any boost I can get. If it’s okay with you, how best can I get in touch with you? Sorry, I don’t do any consults. You can take my free ecourse for more pointers. Hi! I am new to the blogging game and have a quick question; once I am approved for rich pins, will all of my future pins that I create be rich pins? Or will I need to do something every time I go to upload a pin? Thank you! All future and past pins will be rich! Anything linked to your domain. Tried out a few, with no luck. Then decided on Yoast and bingo. Under three minutes, I say. Great step by step guide to finally get those Rich Pins sorted. Even as a total non-techie, it was easy to follow your guide and get this done in less than five minutes. Now all there is to do is wait and hope that Pinterest approves my Rich Pins. Feel a little stupid that it’s taken me so long to tackle this. Thanks for your tutorial. Thank you so much! It worked just like you said and was instantly approved!